I'm in love with the palazzo pants sewn by Arlene Holzman for a special family event. They are elegant, have a gorgeous drape, with just the right amount of fancy. And I'm only a little prejudiced since Arlene chose O! Jolly! New Hudson natural white sweater knit to make them. But really... just look at those palazzo pants! From time to time I've posted pictures of people modeling their O! Jolly! sweater knits. I'm happily posting a few more today. Yes, I do get excited when I see what others make with these fabrics! I develop the knits, have them produced, then send them out into the world wondering what they'll become. I'm so very grateful to those sewists who've shared pictures of their finished garments with me and who've allowed me to post their pictures. 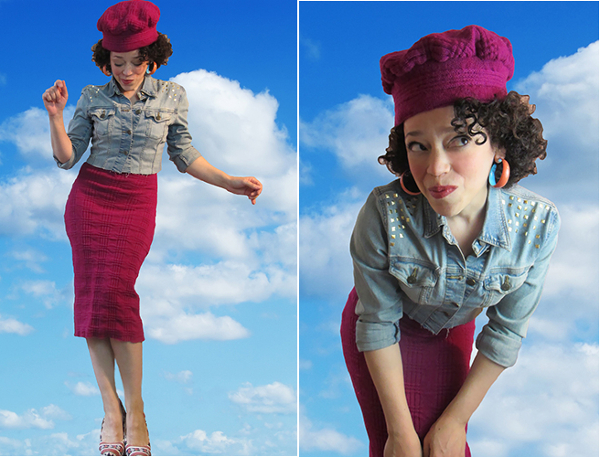 I really enjoy seeing just how creative sewists are and how differently they use the knits. Arlene, after all, used the very same fabric, that Sonja of GingerMakes used to make a Grainline Studio Linden Sweatshirt. 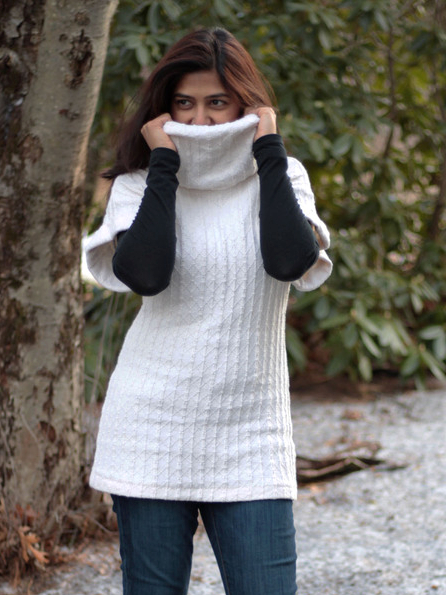 Deepika of PatternReview used the New Hudson more traditionally and made a sweater. She's fulfilling part of her #sewprecious2017 pledge. You may have read that Deepika is challenging herself and others to cut and sew the "precious" fabrics they may be saving in their stashes. (Thanks for considering the fabric special, Deepika. I'm glad you finally sewed it. And I know it looks better on you than on the shelf, in the drawer or other designated hiding place!) Here's Deepika's Burda 7595. You can read her pattern review is here. New Hudson is a rather stable sweater knit, so it can work with a variety of projects. Georgia (I Believe I Can Sew) combined it with natural white 2x2 cotton rib to make a suit with flair and flare. I've been carrying New Hudson in the shop, for almost two years now, ever since I started contracting local mills to knit fabrics to my specifications. Natural White Cotton Jersey is another fabric that I've carried from the beginning and try to always have in stock. Though I don't have many pictures of finished garments with this fabric, the cotton jersey has been the shop's best seller. 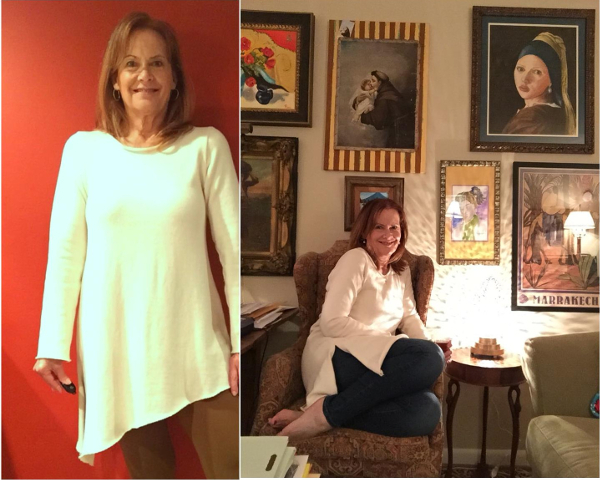 Dorcas (@lonestarcouture on Instagram) made a very lovely and cozy Vogue 9057 tunic in the fabric. Technically the fabric is a jersey, but as you can see, it's sweater weight -- considerably heavier and plusher than the jersey used for a t-shirt. Annie, another sewist, has used this incredibly soft fabric to sew a couple of tunics. Her color-grown light green version is below. This, of course, doesn't mean that the sweater knit jersey can't be used for a t-shirt-style sweater. I absolutely love the cut of this cropped, short sleeve sweater from Olaf Designs in Brisbane in the natural white jersey. A pullover with basic lines will always work for a prominently textured sweater knit. 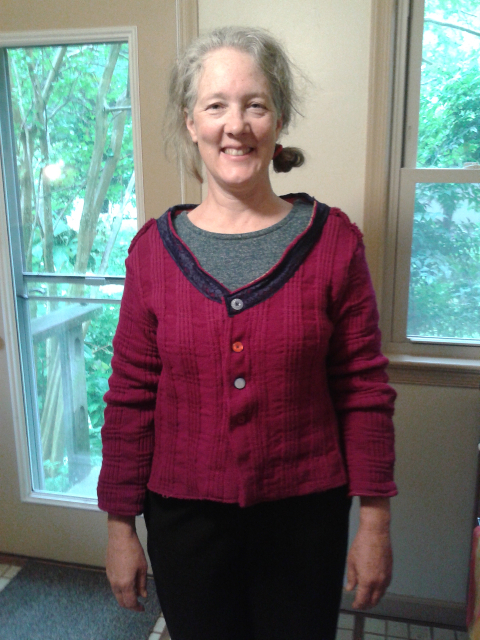 Sonja (Ginger Makes) chose the Mandy Boat Tee pattern for this sweater for her mother-in-law. Marcy Harriel (Oonaballoona) took the same Washington Square on a whole different journey. Though she admits the fabric may not be perfectly suited for the body conscious skirt she had in mind, I happen to think that Marcy in her matching skirt and hat ensemble is a treat. And by the way, Marcy used both sides of the Washington Square fabric for her hat. Yes! The next project could be a wonderful centerpiece for one of my "Scraps Not More" posts. Debbie Iles of Lily Sage and Co pieced together leftover Saratoga Rib fabric from her Megan Longline Cardigan and combined it with plain white ponte to make this uniquely beautiful, raglan top that looks more like a clever design than a combo of cutaways. But then, Debbie is a clever designer with her own line of sewing patterns. "There’s never any fabric waste in my house," says Debbie. I do like the way she thinks. Two more traditional sweaters I'd like to share. Both are cable sweaters sewn by two different bloggers with two different cable knits. Each blogger writes about her process. Neither fabric is available in the shop at this time, but if you haven't read the posts already, you may find them interesting and helpful for cutting and sewing sweater knits in general. Kyle Burkhardt of Vacuuming the Lawn "...Sewed a Sweater From a Blanket". 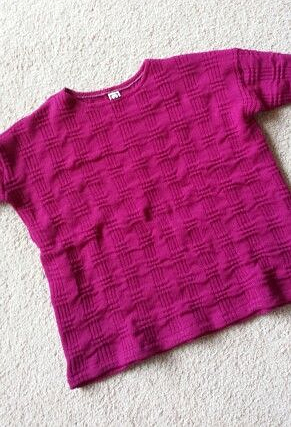 And I'm happy to have just discovered Carolanne (Sweet Carolanne), who "...Made A Cable Knit Sweater... Without Knitting!" I do hope you've enjoyed seeing these makes. Some pics and referenced posts are over a year old (oops). I usually don't get to see what's made with the fabric. Most of the people who purchase O! Jolly! fabric don't blog and are not on Instagram, at least not for sewing. If you're reading this and you've got a photo of your finished garment made with O! Jolly! sweater knit, please let me know. I'd truly love to see it! And I'll only post with your permission. Disclosure: Dorcas and Georgia in above post were Pattern Review contest winners and received gift certificates toward the purchase of their fabrics. Marcy and Debbie received fabric in exchange for photos/blog mentions. For news and discounts on O! Jolly! fabrics and sweater knit sewing tips, I invite you to join the email list. All these projects are so fab! Thanks so much for the shout out, Olgalyn!! Your blog is so informative!